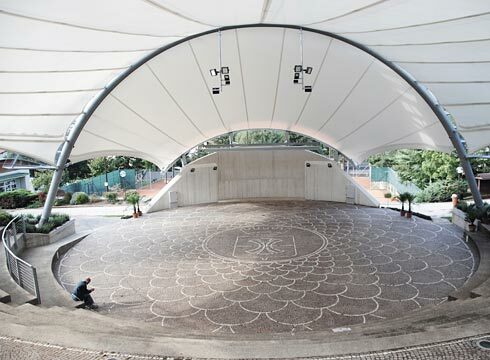 Situated in the rampant part of the municipal park of Lavis / Trentino, the amphitheatre is frequently used for different activities and cultural events such as open-air cinema, concerts and theatre performances. The circular scene with a diameter of 20m is surrounded by semi-circular arrayed concrete seats, embedded in the hillside and providing place for around 800 spectators. Requiring a shelter against bad weather, the mayor of Lavis charged to study the possibilities of an appealing, retractable roofing construction in 2008. Based on the results, the municipality decided to build the project and commissioned the further planning in 2010. The scene of the theatre is covered by a permanent textile roof of 240 sqm, spanned between a new rounded concrete back board and a central arch bearing structure.The supporting arch spans 26m and is anchored back with numerous cables to the hillside. These cables are arrayed in a fan-shaped way and represent the rails for the retractable part of the membrane roofing covering 560 sqm of the audience area. This mobile membrane can be folded and bundled along the main supporting arch, protected by a transparent canopy. The retractable membrane is moved and spanned by manual operation, using ropes, winches and rack gears. The membrane covering the scene is optically detached from the back board, offering a great panorama of the opposite mountains to the spectators. The sonically hard back board and the convex curved membrane roof are causing very good acoustics, equally distributing the sound into the audience. A basic configuration of colour changers permits different, impressive illumination of the membrane surfaces.